Dr. Mueni is a mass communications expert with extensive experience in various mass communication platforms. Her academic interests lie in communication for development, mainstreaming gender through communication, popular media culture and promoting media excellence and freedom. 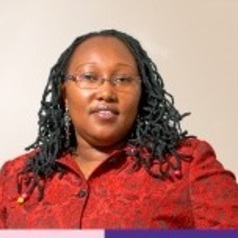 She has written journal articles like “Our Pregnancy, My Choice: A Feminist Critique of Nerea” and “New Media and Political Marketing in Kenya: The Case of the 2013 General Elections”. Her mission in life is to work towards the achievement of an empowered society by the provision of information through research to all classes of people. Also, she aims to advocate for a society sensitive to the dynamics of development and personality diversities through mass media and education. Dr Mueni has previously worked at the University of Nairobi and St. Paul’s University as a lecturer and the Nation Media Group as a reporter. She has been a judge in the Media Council of Kenya Annual Journalism Excellence Awards for the last six years.